Today we drove up to Lancaster, CA to visit the Antelope Valley Indian Museum. We came with low expectations but, it was much more extensive than we had anticipated. For pictures, click here. Christmas in SoCal is a bright, sunny day with a 75° temperature. What's not to love? It's a little cold inside the house this morning. The heat was on for awhile, but the blower stopped working, so now there isn't any heat. Hopefully we can get someone out to repair it soon. When the blower stopped it was 69° and now it's down to 65°. The gas log is burning in the living room, so, that should be of help. We went to the Bowers Museum in Santa Ana today to see their new exhibit, "A Quest for Beauty: The Art of Van Cleef & Arpels." Had photography been allowed, I would have had a lot of pictures, but just seeing the jewelry was worth the trip. More than 200 pieces from the private collections of Van Cleef & Arpels are on display for this international exhibition. The jewelry exhibited here is probably the most beautiful that either of us has ever seen. 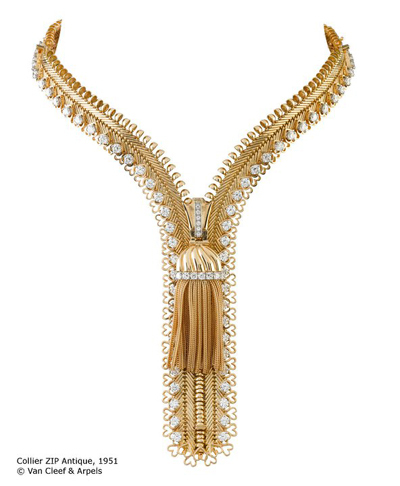 Below are pictures of their iconic "tasseled, zippered necklace," that is transformable into a bracelet. We had to cancel a couple of small trips due to illness. We both had colds but Judy's turned into bronchitis and it's been tough for her to shake it. On a brighter note, we've had some gorgeous weather here the past few days, hitting 80°, which is great for December. Today's adventure included lunch and a double dose of culture in Los Angeles. To see pictures of Sami in the starring role of Belle in Beauty and the Beast, as well as some pictures of the Levitated Mass at LACMA, click here. 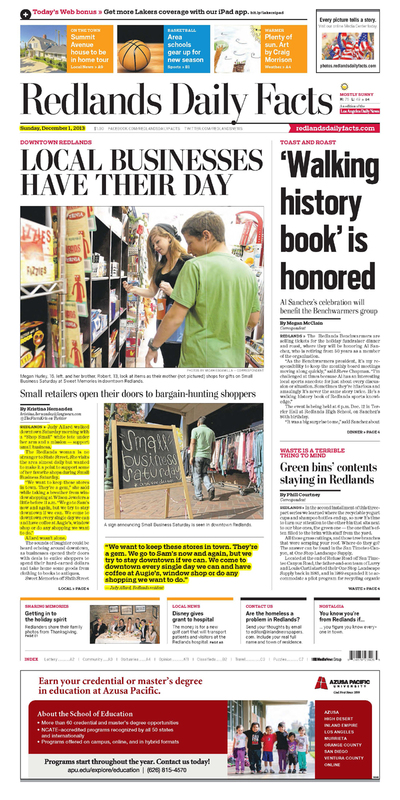 Judy got a little ink today on the front page of the Redland Daily Facts. We broke bread with Marilyn Manson on Thanksgiving! Our elephant ear plant has graced us with a second flower. The first one is slowly decomposing to the left. We've had some cool and overcast weather here in Redlands for the past few days, so it nice getting out today and heading east into some sunshine. We went to Desert Hot Springs and toured the Cabot Old Indian Pueblo Museum. Cabot was a very interesting man. For pictures, click here. We went on a small adventure today that included several stops in and around Los Angeles. Our first stop was in East Los Angeles to see a mural made by Eduardo Oropeza. Unfortunately, while the mural was quite complex, I didn't take any pictures since the building itself wasn't very photogenic. Our second stop was at the Flower District in downtown LA. 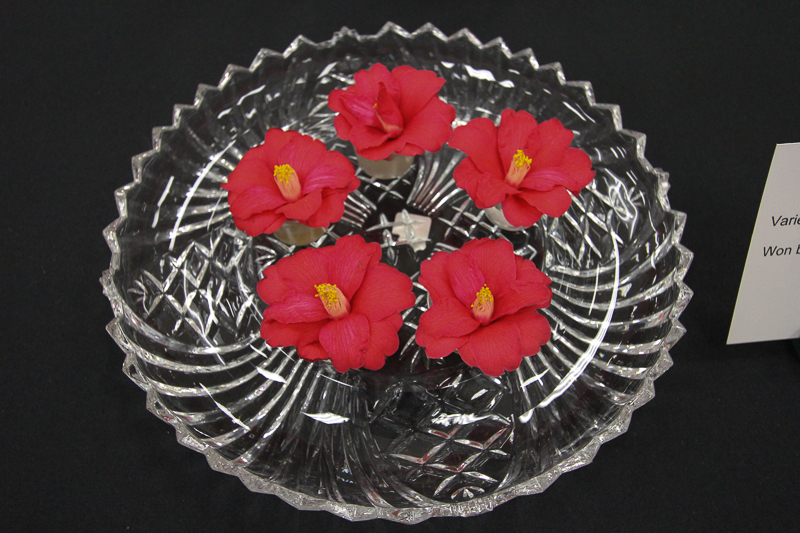 We have seen many pictures of it whenever the local television stations cover holidays, especially Valentine's Day. 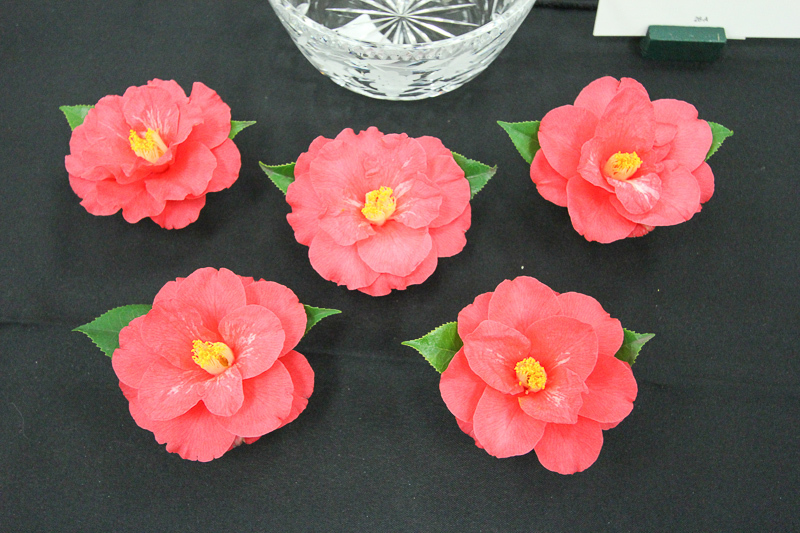 Between all of the many vendors in the area, it wouldn't be very hard to completely supply a florist shop in a couple of hours. They have everything! 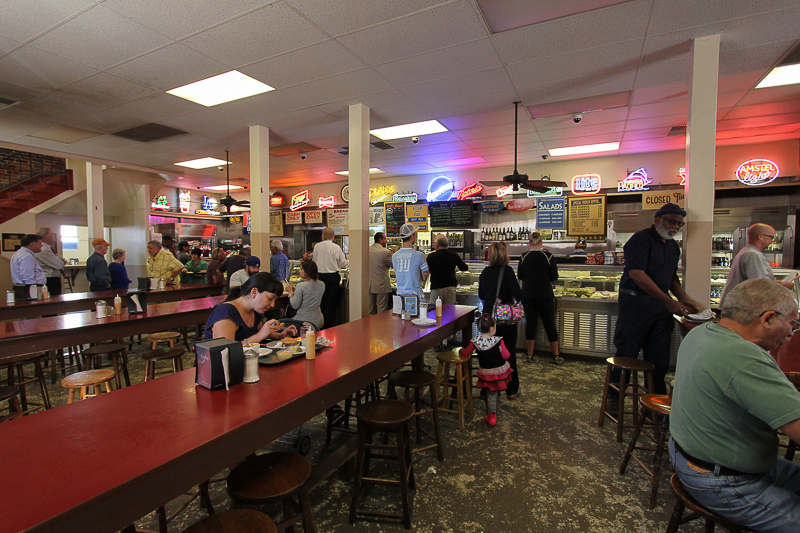 The last stop was the highlight of our trip, which was lunch at Philippe's, the home of the French dip sandwich. Philippe's is located on North Alameda Street close to Union Station. Philippe's "French Dipped Sandwich" is the specialty of the house and consists of either roast beef, roast pork, leg of lamb, turkey or ham served on a lightly textured, freshly baked French roll which has been dipped in the natural gravy of the roasts. The customer can choose "single dip," which is just the top half of the roll, or "double dip," where the server dips both the top and bottom portions of the roll. We both had the roast beef "double dipped" with potato salad, pickled hard boiled egg and lemonades. Judy thought the potato salad tasted pretty close to what Mama used to make. everything was delicious! We have some kind of a mystery plant growing outside the media room, and I'm going to have to do a little research to determine what kind of plant it is. This is a front view showing the leaves and something resembling a flower emerging in the middle. 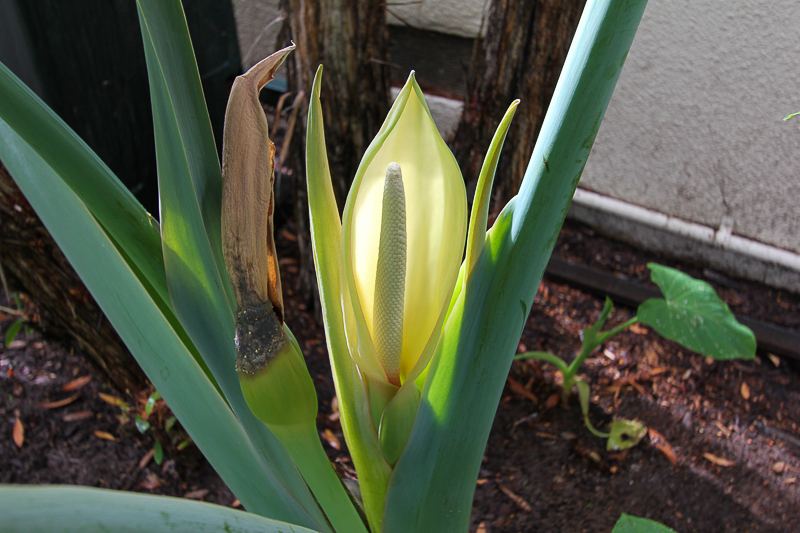 When I went around to the back side of the plant, I could see that the "flower" has already emerged. It's beautiful, but unfortunately, I had no idea what it is. After searching the Internet, I found a great source in identifying plants that was written by Dr. Lena Struwe of Rutgers University. It helps to identify 50 plant families and it works extremely well. It appears the mystery plant is part of the Arum family, technicality known as the family araceae. 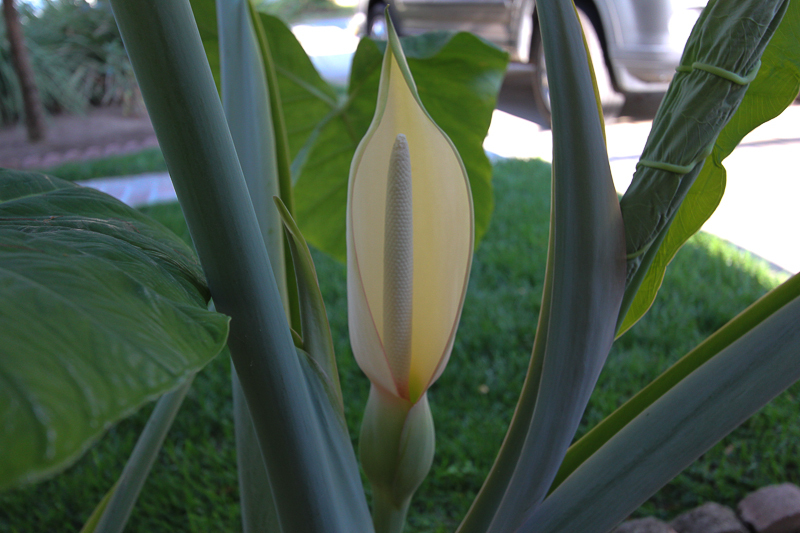 I would guess that the most commonly known plant in the same family is the calla lily. 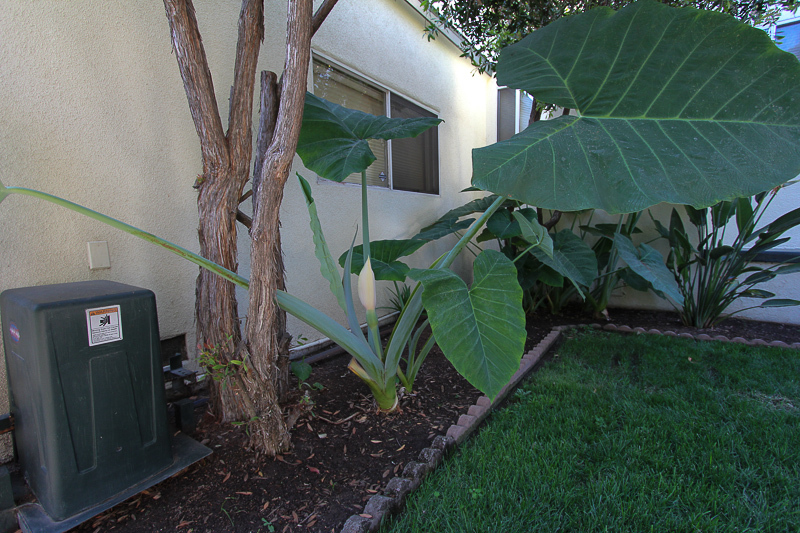 From further research, it looks like it is an xanthosoma sagittifolium, which is commonly called an arrowleaf elephant's ear. Cool! We took a spur of the moment trip today to the mountains. Our destination was the Keller Peak Fire Lookout in Running Springs, CA. To see some pictures of our adventure, click here. Today we were at the Bowers Museum in Santa Ana to see their latest exhibit, Gods & Gifts: Vatican Ethnological Collection. Photography wasn't allowed, but, if you follow the link above, you'll see some of the items on loan from the Vatican. We also saw an exhibit of temple murals painted by a Buddhist monk and noticed that the dates on the place cards identifying each mural didn't match the date on the painting. I ran into the president of the Bowers, Peter Keller, and asked him about the discrepancy. He acknowledged the mistake and will make sure it's corrected. 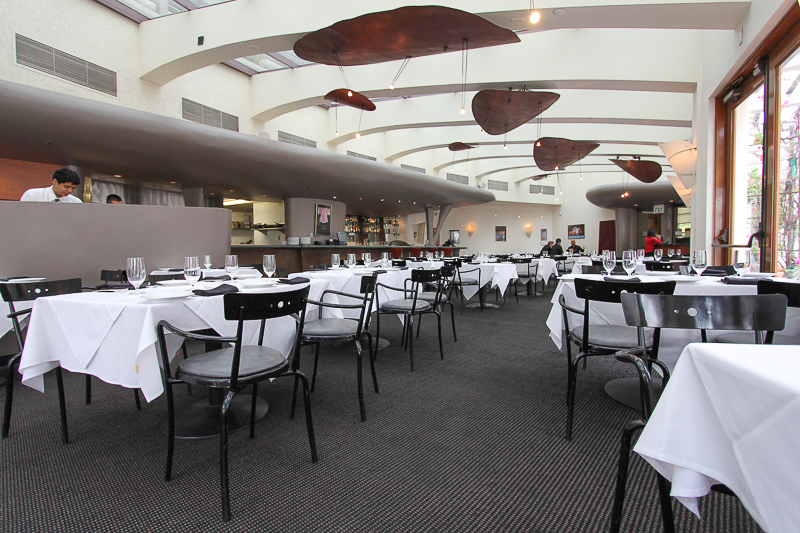 The real highlight of the day was our lunch at Tangata, the restaurant located within the Bowers. I had the Prince Edward Island Mussels, which are steamed mussels, shallots, garlic, fresh herbs, cracked black pepper, and grilled croutons, all in a white wine broth. Judy had the Grilled Flat Iron Steak, which is a grilled flat-iron steak, confit fingerling potatoes, and Swiss chard, with a garlic-herb butter. The food was fantastic as well as the Pinot Grigio and the classic Tahitian vanilla crème Brule we had for dessert. Today we visited the Earl Burns Miller Japanese Garden on the campus of California State University in Long Beach. For some pictures, click here. We spent October 1st, 2nd and 3rd touring California's central coast and Big Sur. I took a lot of pictures of this beautiful area so click here to see just a few of them. We're enjoying the beautiful fall weather here in SoCal with cool nights and warm days, plus clear, blue skies. We couldn't ask for more. We had some fun gambling yesterday at the Morongo Casino, unfortunately, it was just fun, but no winnings. Los Angeles has spoken! 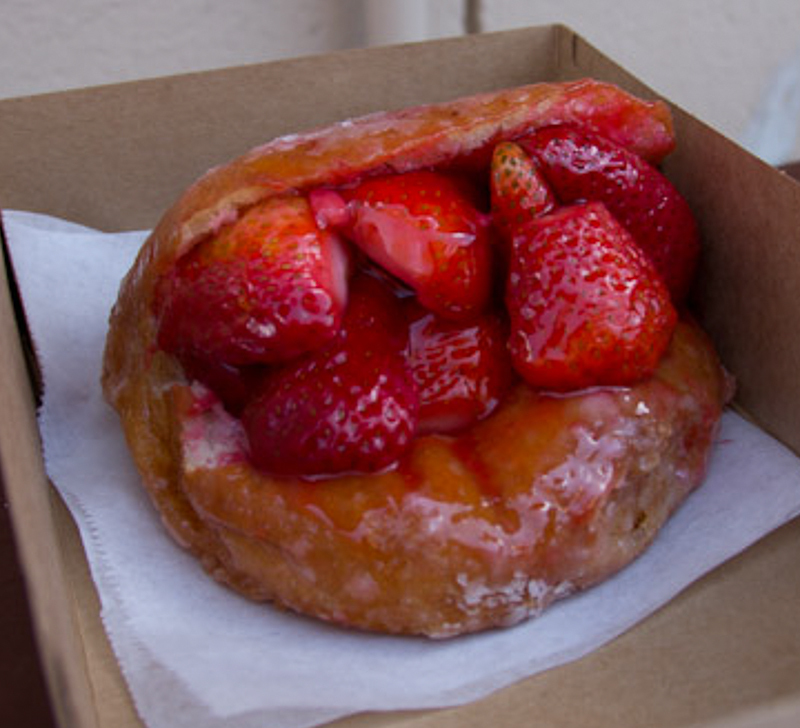 There was a viewers' poll by the KCET television station and LA's most iconic food is the strawberry donut made by the Donut Man in Glendora. We were there in June of 2012 and they are delicious! In January of 2011 we went to the Consumer Electronics Show in Las Vegas and had dinner at our favorite L.V. restaurant, Piero's. At the table next to ours was Steve Lawrence and two other men. Before we left we introduced ourselves and told Steve how much we had appreciated his work over the years. We had a nice chat with him for a short time. This past August, his wife and the love of his life, Eydie Gormé, passed away. Even though our encounter with him was brief, we both wanted to send him a card of condolence. We couldn't find any information on the Internet about where we could possibly send the card so, we sent it to him in care of Piero's mailing address. Of course, that was like mailing a card into a black hole since we didn't know if it would ever get to him, so we forgot about it. However, in today's mail there was a small envelope with a Las Vegas return address. It was a note from Steve acknowledging the receipt of our card. What a guy! Earlier today we went back to the Riverside Art Museum for a leisurely stroll through the galleries and a super lunch thereafter. For additional pictures, click here. On this twelfth anniversary of 9|11 we had a very memorable day by visiting the Los Angeles Fire Station 112 in San Pedro. For pictures of our adventure, click here. 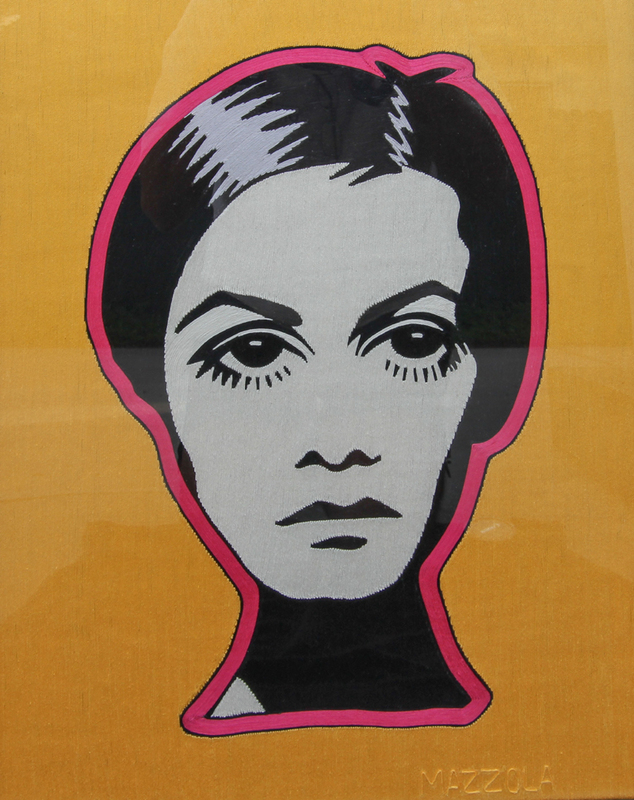 We recently purchased a "thread painting" by Toni Mazzola of Redlands. Her technique is derived from the Huichol people of Mexico, a Native American ethnic group. Her "Twiggy" is a wonder! The weather here lately has been awful because of the monsoonal moisture that arrives this time of year. Yesterday morning the relative humidity was 84%, but we generally experience humidity levels around 10% for most of the year, so it's quite an adjustment. It's expected to pass by next weekend, but unfortunately our temperatures are also expected to rise. However, even with its infrequent disappointments, I wouldn't want to live anywhere other than Southern California. Today we had the opportunity to tour the William Andrews Clark Memorial Library in Los Angeles. It's owned by UCLA and it pretty much is a lesser known jewel here in Southern California. It is beautiful! For pictures, click here. Forty-four years ago today I was arriving in Bethel, NY for "three days of peace and music." There was only one Woodstock, August 15 through August 18, 1969. You never know unless you try, so today we tried the Hollywood Bowl. On Tuesday and Thursday mornings, during the summer season, they rehearse their classical programs and the public is invited to watch and listen for free! Sounds great, except that our memories of Tanglewood have spoiled us. At Tanglewood you can sit on the lawn, bring a picnic lunch, drink some wine and relax to the music during their Saturday morning rehearsals. 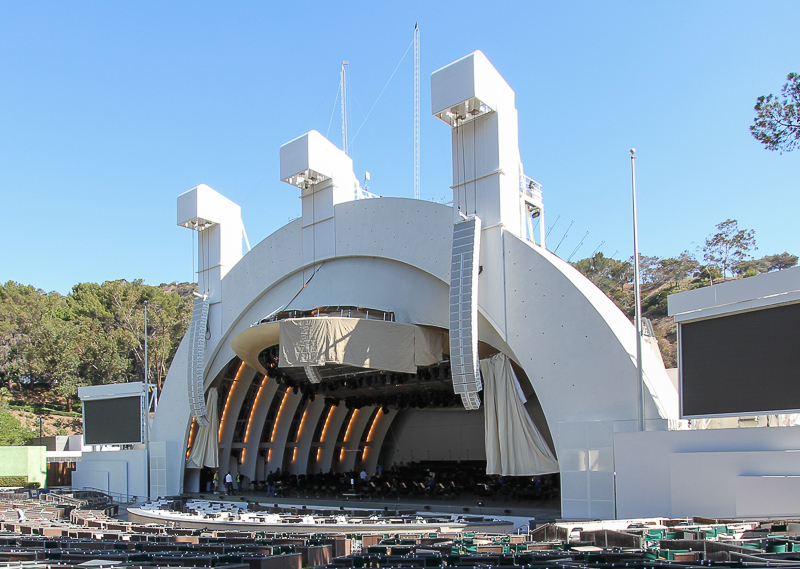 At the Hollywood Bowl, you can only sit in certain sections of the bleacher seats, which weren't all that comfortable, and it didn't even come close to deliver the same ambiance that Tanglewood does. Quel dommage! The saving grace for the day was lunch at Il Forno Caldo in Beverly Hills. Linguine with clams for me and Chicken Curry Pizza for Judy. With the Super Tuscan wine, everything was perfect. We went to the Bowers Museum in Santa Ana today to see their new exhibit "The Tsars' Cabinet: Two Hundred Years of Decorative Arts under the Romanovs." It had 200 objects dating from Peter the Great to Nicholas II, who was murdered during the Bolshevik Revolution of 1917. The execution of Nicholas, his wife Alexandra and their five children marked the end of the Romanov dynasty. Most of the pieces were porcelain but, unfortunately, photography was not allowed. One of their dinner services had 900 pieces and another took twenty years to complete! We had lunch at Norm's before going in and had coffee at Augie's upon our return. Yesterday we used our Groupon and had brunch at Le Rendez-Vous restaurant in San Bernardino. They consistently put on a good show here and the food is bountiful and fabulous. They also happen to make some of the best Bloody Mary's that we've ever tasted. Today we saw the "King of the Missions," the Mission San Luis Rey de Francia in Oceanside. The complex is very large and it probably was the best maintained mission that we've seen in our travels. For pictures, click here. Today's adventure brought us to the Forest Lawn Memorial Park in Glendale, CA. To see some pictures of this beautiful place, click here. I just finished a riveting biography about Dorothea Lange, written by Linda Gordon. What a story, what a writer! Kudos to Gordon! We were at UCLA today to check out the campus. For pictures, click here. Today we finally toured the Sunnylands estate in Palm Springs. It was as magnificent as we thought it would be. For pictures, click here. 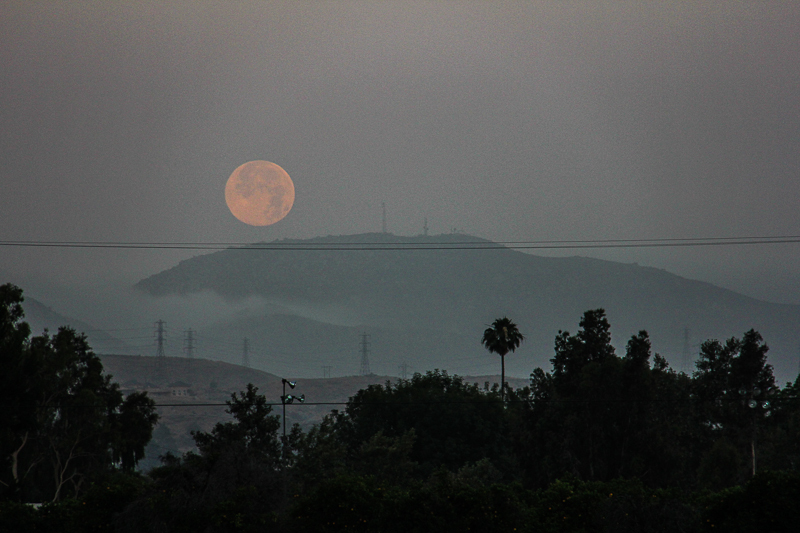 I went out early this morning to take a picture of the "Supermoon," which wasn't as spectacular as promised, but it was somewhat hazy this morning. We just had a 3.1 magnitude earthquake here in Redlands. Judy and I were both sitting and felt the rapid shaking motion. This is the second quake over 3.0 since I started tracking them three years ago. I just finished book #172 on my reading list, about Hedy Lamarr. A box office bombshell and the inventor of spread-spectrum technology? Who knew? It is a very interesting story. Since moving to Redlands four years ago, we've heard about the Le Rendez-Vous Restaurant in San Bernardino, but we had never got around to trying it. There had been several Groupon deals here in the past, but how the Groupons worked for their Sunday Brunch was a little unclear, so we were curious but never took a chance. Finally we bought a Groupon deal and decided to try it out. After all, how bad could it be? Well, it wasn't bad at all, in fact, it was wonderful. The food is creative, delicious and beautifully presented. The service was great and we ate ourselves to excess. We're sorry that we didn't try it sooner than we did. We drove to the Getty Villa in Pacific Palisades today to see their new exhibit, "Sicily: Art and Invention between Greece and Rome." For pictures, click here. Things are returning to normal after an unsettling couple of days. When I was out running Sunday morning, I saw SoCal Edison crews beginning to repair a split telephone pole on Center Street along with a truck, in the process of being towed away, with extensive damage to the front right. Everything was fine for six hours here, but at 12:36 PM, our power went out. It made for a long Sunday and into Monday morning. The power was finally restored about 4:57 AM on Monday morning. It was warm without our fans or AC, but it could have been worse. Of course we lost a lot of food since the refrigerator and freezer had lost their cool. We real a story about the power outage in yesterday's Daily Facts, which showed how stupid people can be. The 22 year old driver of the truck fled the scene after he crashed into the pole. The police picked him up at the Redlands Hospital and he will probably be charged with leaving the scene of an accident involving property damage. What a genius! Judy returns today from her trip to Grass Valley, CA to see her sister Beverly. Of course the two gamblers made a casino stop yesterday. Beverly did great but Judy finished out of the money. Bev always seems to do well. Today we enjoyed a wonderful two hour tour of the original campus of Caltech in Pasadena, CA. For pictures, click here. I just finished a biography of Henry Kissinger that was written by Walter Isaacson. This was the third Isaacson biography I have read and he has to be the best author I have found in this genre. The other two works were biographies of Benjamin Franklin and Albert Einstein. We took a trip to Riverside today for lunch and a couple of sites. Our first stop was to see the "Parent Washington Navel Orange Tree," since it's been in the news lately about concerns for its health. 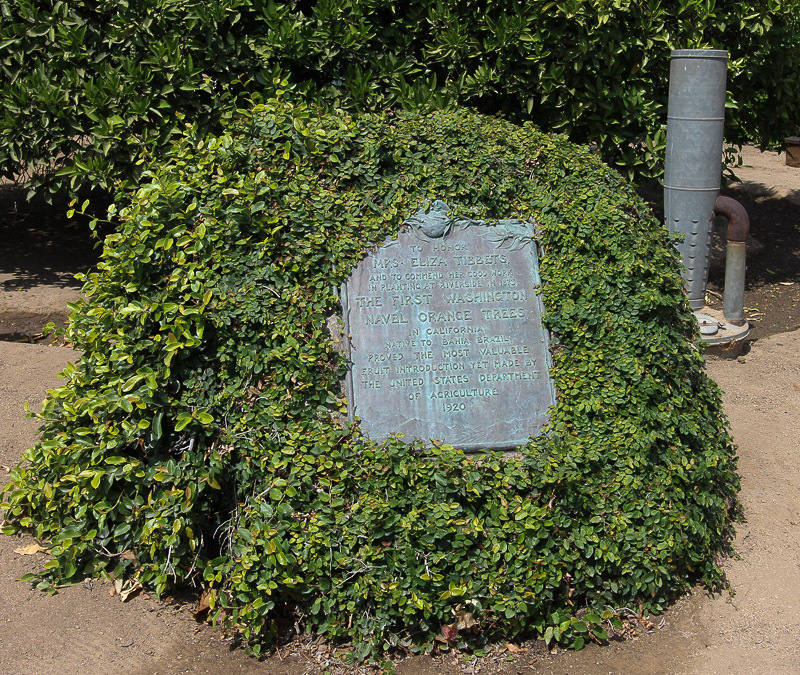 The tree is one of two from which all California Navel Oranges have descended; the other died in 1921 after being transplanted to the Mission Inn in 1903. 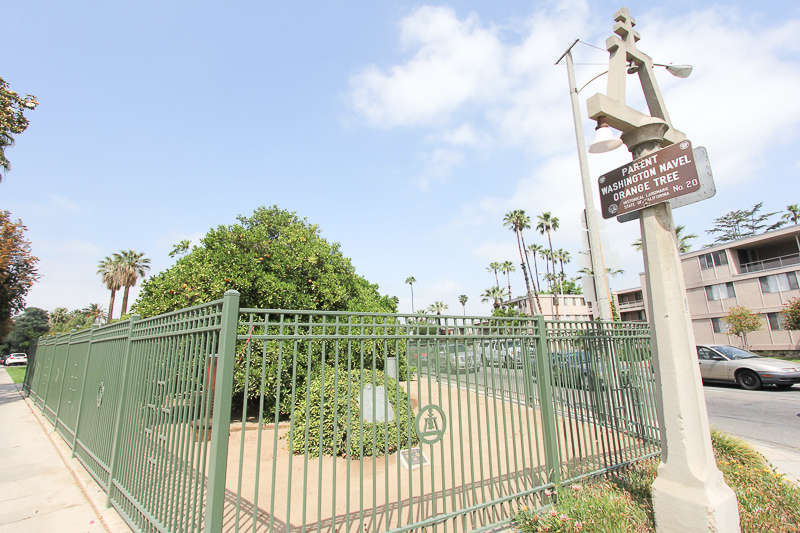 The trees came to Riverside in 1873, sent to Eliza Tibbets by William Saunders of the U.S. Department of Agriculture from Washington D.C., after originating in Bahia, Brazil. The fruit they produced were large, sweet, flavorful, seedless, and immediately became legendary. Millions of trees were propagated from progeny of this mother tree, not only in California, but worldwide. At 140 years old, this tree is still producing fruit! Lunch was at Giuliano's Trattoria and the food was great, as always. After lunch we visited the small California Museum of Photography in downtown Riverside, which is operated by the University of California Riverside. It's a beautiful day here in Redlands and the thermometer has hit 100°. I took my first dip in the pool for 2013, which, at 73°, felt very refreshing. Yesterday we took a ride to Palm Springs to show my sister Nancy a little sun. It has been rainy and/or cloudy in Redlands since she arrived at the beginning of the week. 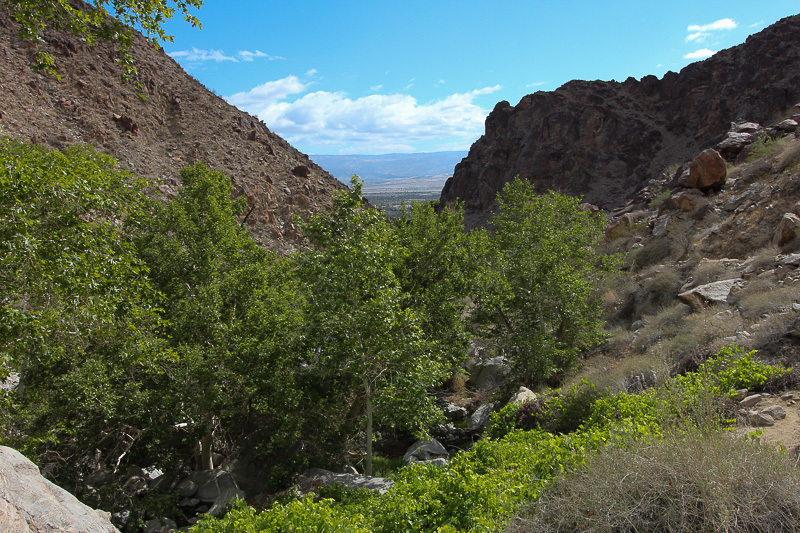 We hiked the Tahquitz Canyon and also went to the Aqua Caliente casino to gamble and have lunch. I was lucky at the slots so the casino paid for our lunch. Although the waterfall at Tahquitz wasn't as spectacular as it was in November 2011, it was still a beautiful day to enjoy the outdoors. This past week has been like summer, with temperatures in the nineties. Now things have cooled down but we expect the temperatures will rise again by the end of this week. The fire crews seemed to have contained most of the wild fires that had started about a week ago, to everyone's relief. Fire season started early this year. We had a fun day today doing something that was a little out of the ordinary for us. We went shopping! We first went to "The Alley," which is our new substitute for our old beloved "Ocean State Job Lot" store back east. It's a fun store since you never know what's going to be on sale there. After that we went to Victoria Gardens for more shopping and, of course, lunch. Lunch at the Kabuki Japanese Restaurant was very satisfying since we both enjoy their shrimp and vegetable tempura. Today we were in Hollywood to visit the Hollywood Museum at Hollywood and Highland. Their inventory of movie memorabilia is overwhelming. For pictures, click here. 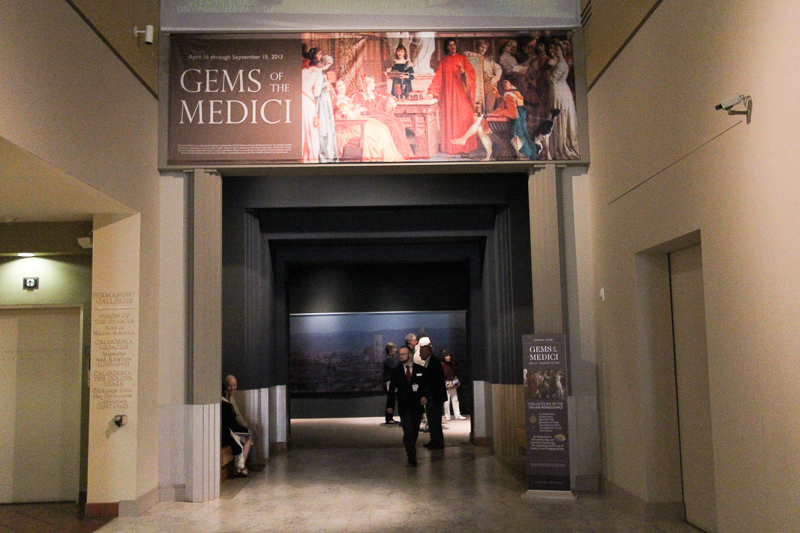 Today we went to the Bowers Museum for the members' preview day of their new exhibit, Gems of the Medici. Unfortunately, no photography was allowed, but, since most of the pieces were very small, they probably would not have photographed very well even if it had been allowed. However, in addition to seeing the precious gems, carvings, sculptures and other works of fine art, we also heard a very scholarly lecture by Dr. Liliana Leopardi, concerning the exhibit and its symbolism. Some of the antiquities we saw dated from the 1st century BCE. We had a nice little adventure today at the California Citrus State Historical Park in Riverside. For pictures, click here. We did something a little different for Easter this year. There was no ham, or any of the "fixings," no dinner at all at home. We ate out at Norm's Restaurant and saw a play in Los Angeles instead. The play was End of the Rainbow at the Ahmanson Theatre. Tracie Bennett had the lead role as Judy Garland and she was fabulous. What a voice! Going out for Easter may become a new tradition for us. 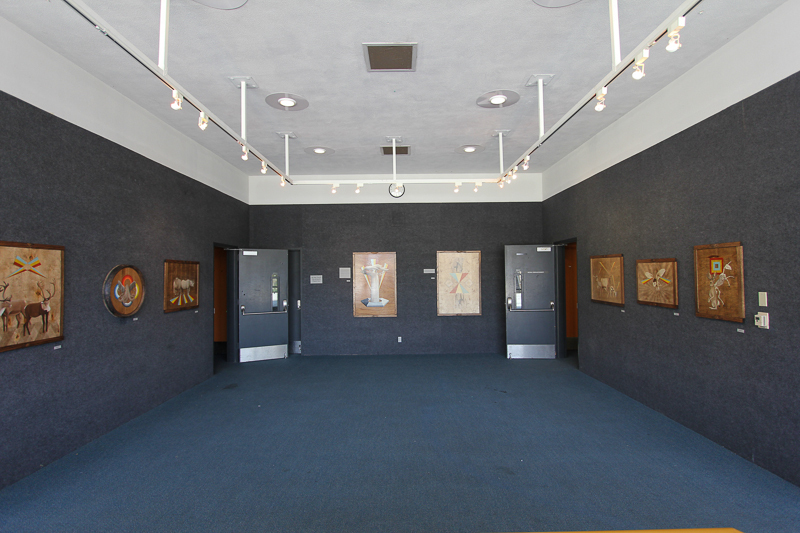 Today we visited Crafton Hills College in Yucaipa to see an exhibit by James McClung. 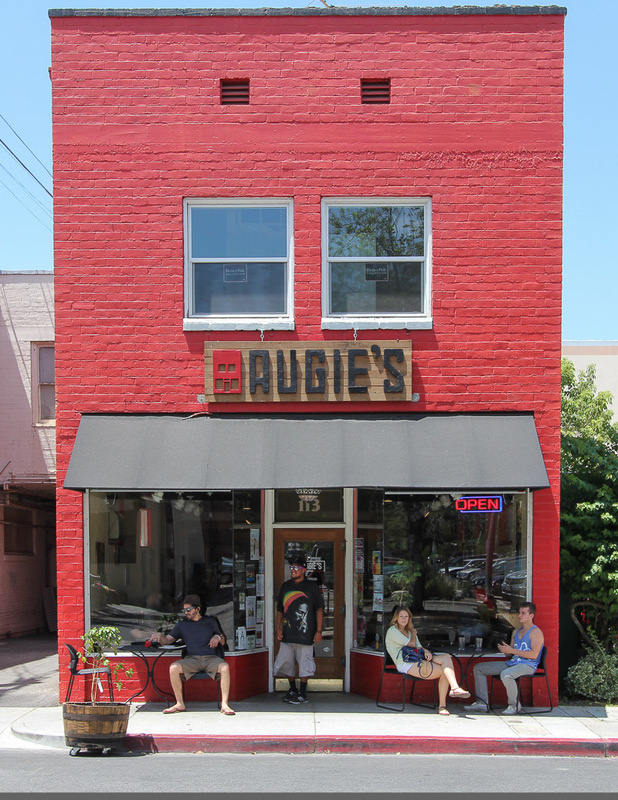 Judy and I often chat with James and Amanda while enjoying our coffees at Augie's Coffee House. And we're also one of his patrons since we have two of James' paintings in our home. On James' Facebook page he describes the exhibit as: "This is titled "One", which is a product of paintings that reflects on how the world, life, spirit, nature etc can work as one." His work is brilliant. 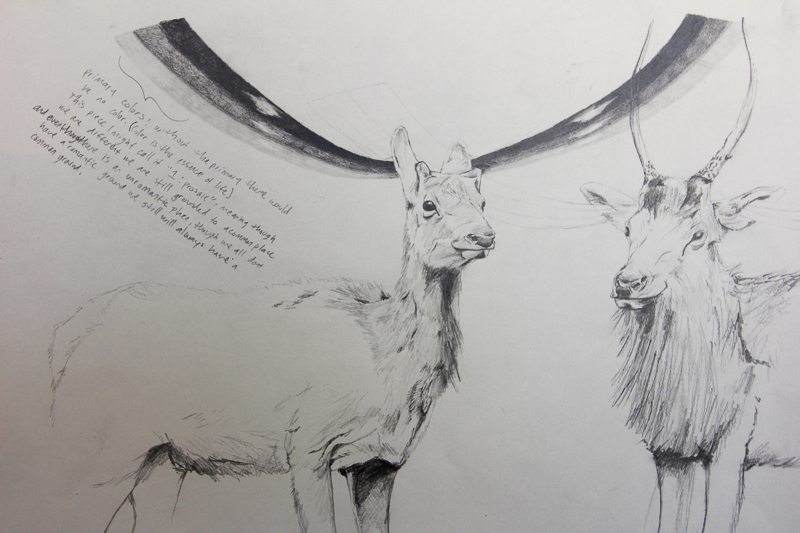 James' work is available through his site on Etsy. Click here for the link. 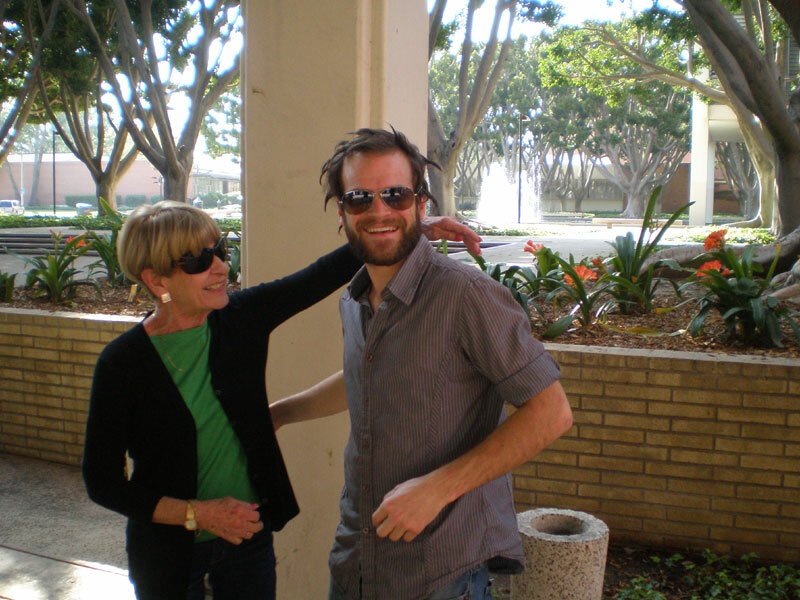 Yesterday we drove down to Long Beach to see our nephew Brandon, who has the lead role in the University Players production of Jack Goes Boating. 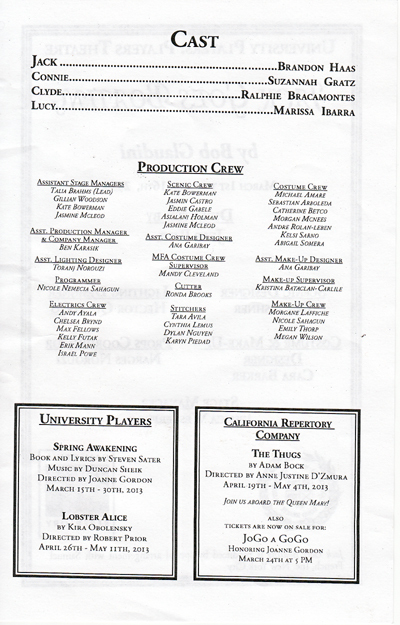 This is the second time that we have gone to California State University, Long Beach to see Brandon perform. We were happy to congratulate Brandon after seeing his performance, which was great! This production was excellent on all levels: the cast, the set design, lighting, audio, direction and everyone who contributed to its success. 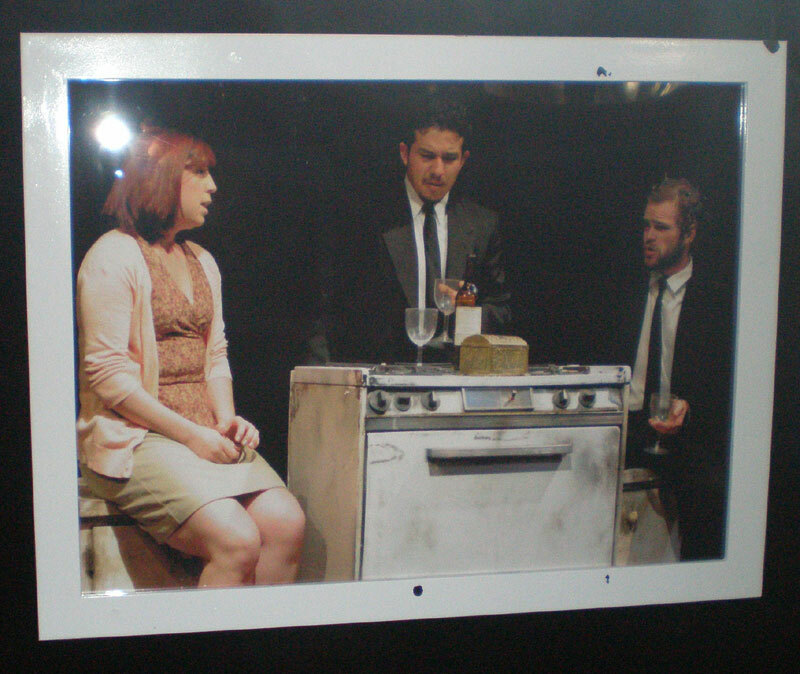 This is a publicity still of Brandon and fellow cast members Suzannah Gratz and Raplhie Bracamontes. Marissa Ibarra, who played Lucy, is not shown but her performance was also outstanding. 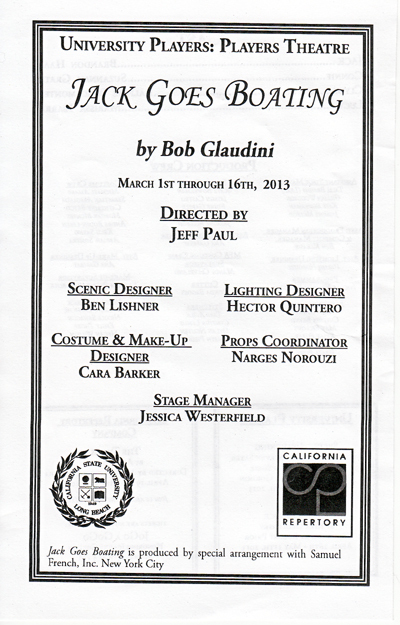 Congratulations to all on a performance very well done! The seismic activity in SoCal continues. In the last week there have been 43 earthquakes in Redlands and 875 in our local USGS mapping area. The seismic activity in SoCal continues. In the last week there have been 36 earthquakes in Redlands and 840 in our local USGS mapping area. There has been a lot of seismic activity here in SoCal lately. Caltech is reporting 740 earthquakes within our small portion of the Los Angeles area. In Redlands specifically there have been 24 earthquakes in the last seven days. Our weather has been unbelievable lately, in fact, it was 92° here today. 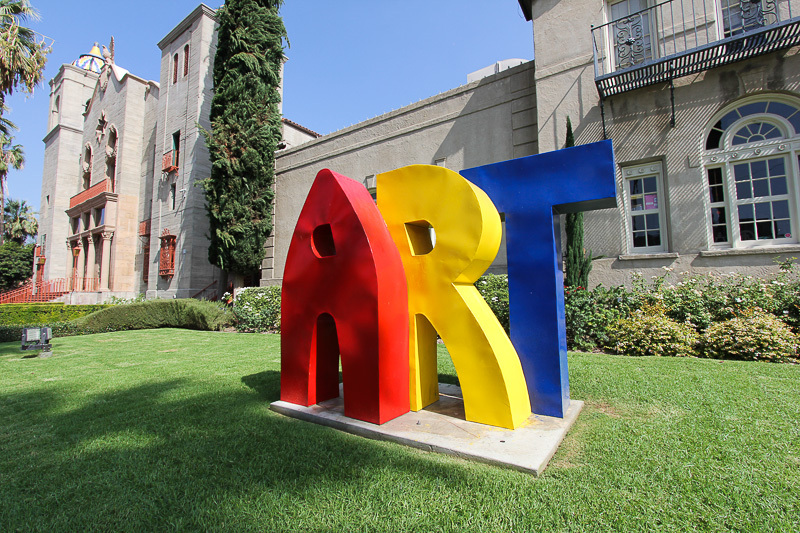 We visited the Riverside Art Museum today to see the Plein Air Artists of Riverside "Paint Out Exhibit 2013." Some of the paintings on display were stunning. For pictures, click here. We're both moving a little slow this morning. Last night we took in the Flamenco dinner show at Cafe Sevilla in Riverside, so that kept us up later than usual, plus the clocks moved ahead an hour for daylight savings time. The Flamenco show was very good and Judy had never seen one. I had seen one once in Madrid around 1975, so it had been a while for me. The food was typically Spanish, which isn't one of our favorite cuisines. All in all, we were glad we went since we don't think we would go to Spain to see the real thing. We turned into motor heads today by taking in the Petersen Automotive Museum in Los Angeles. For pictures, click here. We enjoyed a very warm day in Los Angeles today, touring the Hancock Memorial Museum on the campus of USC. For pictures, click here. Winter is temporarily over as we begin to enjoy temperatures in the eighties for the next few days. Unfortunately we are way behind in the amount of actual rainfall this year, compared to the historical averages. We've received only about five inches of rain since July 1, 2012 and we should have received close to eleven inches. I just finished my latest biography about Franz Kafka, who was a very interesting individual. So I'm now into the 11th letter of the alphabet, and I'm wondering what the next biography will be. I think I'm going to skip all of the Kennedy's and Martin Luther King, Jr., so I simply don't know who will be next. It was a beautiful Sunday morning today so we took a ride to Norm's Restaurant in Claremont for breakfast. 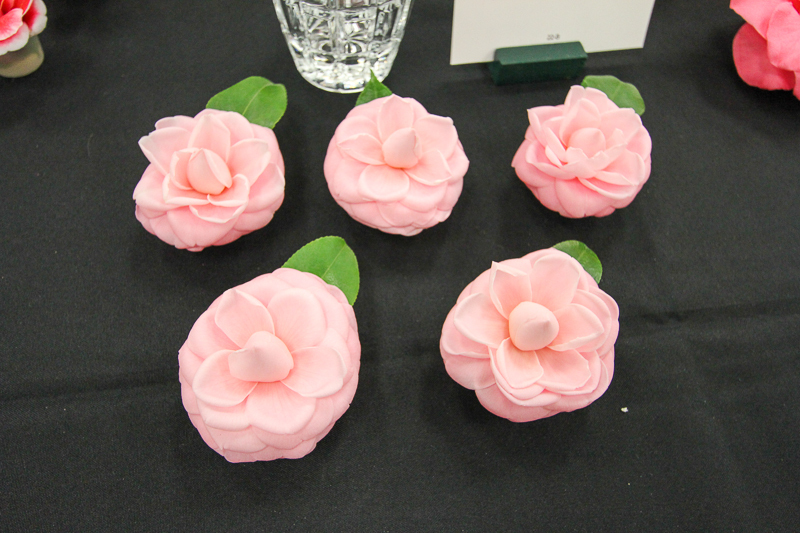 After breakfast we drove over to La Verne to see the annual Camellia Show sponsored by the Pomona Valley Camellia Society. 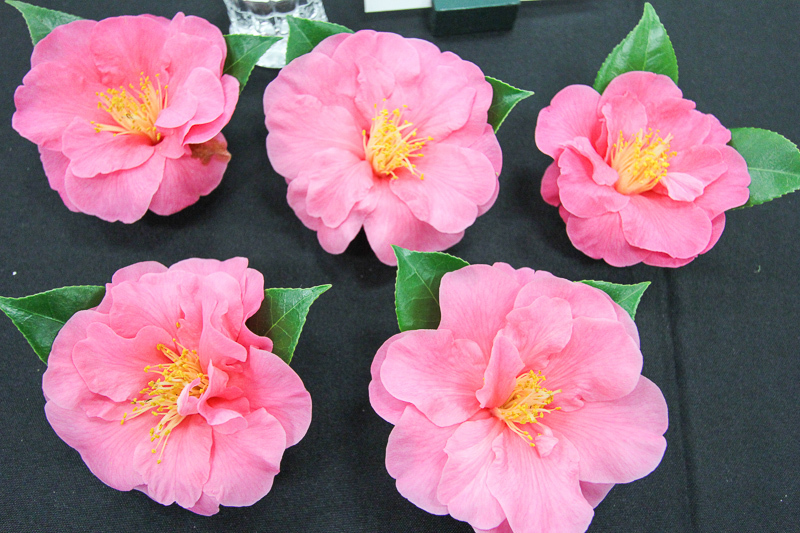 We knew that there must be a lot of varieties of camellias, but we didn't know that there would be so many, probably close to one hundred. Here are a few pictures of some that we saw. We spent a very enjoyable day today at the Bowers Museum, which included lunch at their Tangata Restaurant. We went to see their "Lucy's Legacy: The Hidden Treasures of Ethiopia" exhibit, as well as a film about "Ardi," one of Lucy's ancestors who pre-dated her by over one million years. For pictures, click here. We turned on the television yesterday afternoon about 2:30 PM after hearing that Christopher Dorner was holed up in a cabin by Big Bear. The news coverage was continuous and riveting. Obama's State of the Union address was not broadcast on KCAL9, the Dorner coverage continued through the night and we watched until 8:00 PM. CBS2/KCAL9 correspondent Carter Evans was describing the situation to anchor Sandra Mitchell via cell phone when authorities began exchanging gunfire with fugitive Christopher Dorner. Gunfire was heard from several directions. Eventually the cabin was set ablaze by San Bernardino SWAT teams and it burnt to the ground. Charred human remains have been found in the burned cabin where police believe fugitive ex-cop Christopher Dorner was holed up after trading gunfire with law enforcement, authorities said. Although no positive ID has yet been made, it appears that Dorner has met his end. The manhunt for Christopher Dorner is coming to an end. He is currently holed up in a cabin in Big Bear and is surrounded by law enforcement. He has already shot and wounded two police officers. The manhunt continues for the rogue cop Christopher Dorner, whose last known whereabouts was in the vicinity of Big Bear Mountain, which is about twenty miles from here. The LA Times is reporting that elected officials and law enforcement authorities are expected to offer a $1-million reward for information leading to the arrest and capture of fugitive ex-cop Christopher Jordan Dorner. After posting yesterday's pictures of the Mission San Gabriel Archangel, I realized that I had never posted any pictures of Mission San Juan Capistrano on the web site. This was kind of a forgotten road trip. We had arrived in CA on June 25, 2009 and went to the Mission on July 14, 2009 as one of our first road trips. Shortly thereafter we purchased our home in Redlands and were consumed with fixing it up for nearly six months. So today I added a page for the Mission to keep our web diary up-to-date. to see them, click here. Today we visited two sites: the Southwest Museum of the American Indian Collection in Los Angeles and the Mission San Gabriel Archangel in San Gabriel, CA. When we started out, we didn't plan to go to the Mission, since we thought that the Southwest Museum would keep us occupied for quite a while. However, when we got there, we found out that most of the Museum was closed due to renovations. It was pretty disappointing. The Southwest Museum is second only to the Smithsonian in the number of Native American Indian artifacts, reportedly numbering over 250,000. 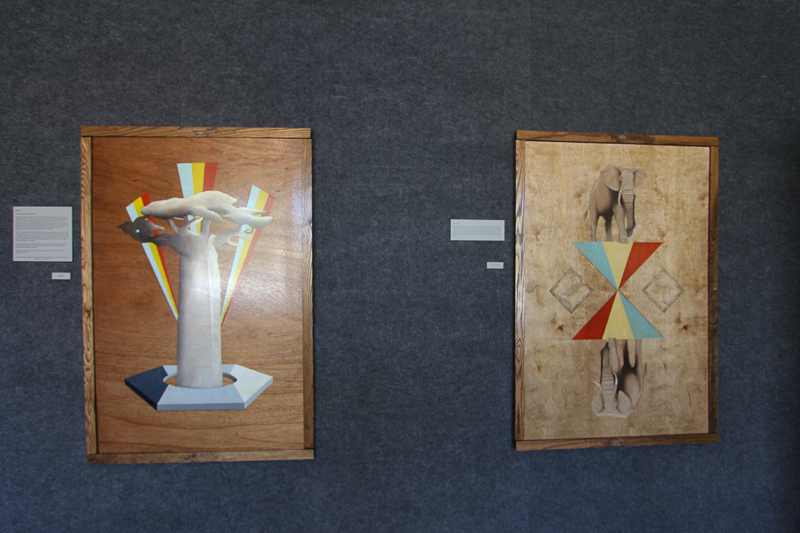 When there today, only about 100 were displayed due to the ongoing renovations and conservancy of the artifacts. We'll try the Southwest again later this year, when those renovations and conservancy programs are complete. The Mission in San Gabriel was close by, so we took it in, and we were glad that it was there since it saved the day for us. For pictures, click here. We went to the Norton Simon Museum today to see Vincent van Gogh's 1889 "Self-Portrait." We also had the chance to visit with Aira Dungca. For pictures, click here. We had a 3.1 earthquake here yesterday at 6:10 PM and never felt a thing.! However, at last the cold spell has broken and we're back in the seventies. We enjoyed the beautiful weather today at the Autry National Center in Los Angeles. For pictures, click here. It has definitely been winter here in Redlands, with temperatures in the fifties. To cure our cabin fever we hiked the Palm Canyon today down in Palm Springs. For pictures, click here. Yesterday Californians heard of the passing of one of their favorite sons, Huell Howser. Heull's broadcasts touched millions of lives here in the Golden State, Judy and I included. Greg Braxton of the Los Angeles Times posted this notice of Huell's death. "Known for his gee-whiz enthusiasm in interviews, Huell Howser highlighted the familiar and the obscure all around the state. His public TV series included 'California's Gold,' 'Visiting,' 'Road Trip' and 'Downtown.' Huell Howser seemed an unlikely candidate to become a television star — a big, grinning ex-Marine with a molasses-smooth Tennessee drawl and an eye for stories that others would pass by, such as the Bunny Museum in Pasadena and the rendering of artwork out of dryer lint. His platform was traditional and unflashy — highlighting familiar and obscure spots all around California in public television series, particularly "California's Gold." But though his shows were focused on points and people of interest, it was Howser who turned into the main attraction, tackling his subjects with an awe-struck curiosity and relentless enthusiasm. Howser, 67, an iconic figure in public television, died at home Sunday night, his assistant Ryan Morris said. The cause of death was not released." Rest in peace Huell, you were "AMAZING!"